At the same time, the world of website promotion can be intimidating and confusing, not to mention expensive. Not everybody has the financial budget to sink into paid advertising campaigns and event sponsorships. Here’s the good news: in this article, I’m going to introduce some tried‐and‐tested strategies you can use to promote your website and increase your traffic, as well as detail exactly how to execute them. Plus, you don’t need to spend a cent! 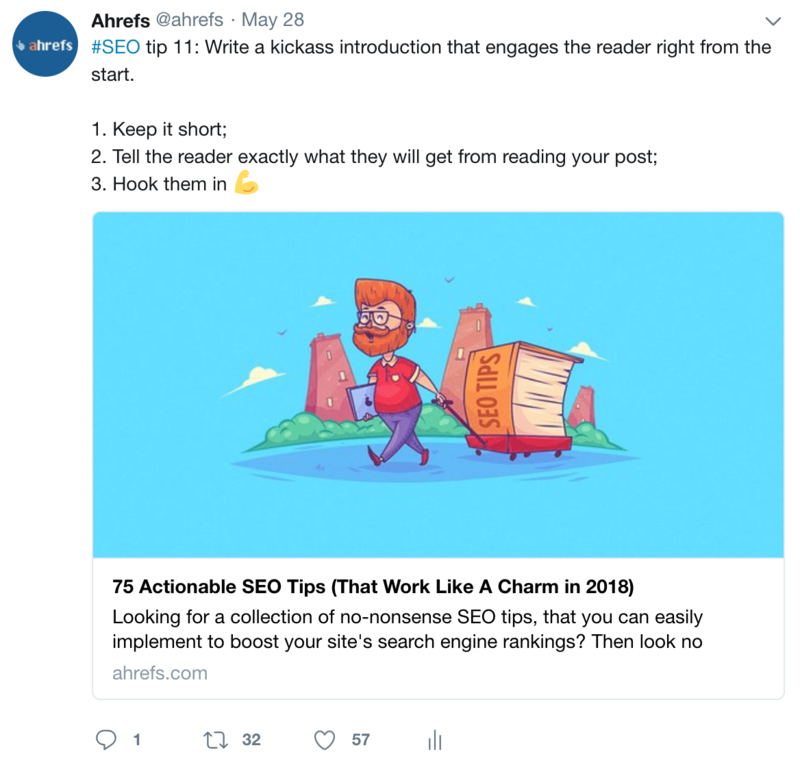 Read more on our story: How to Increase Blog Traffic by 1,136% and Get Thousands of Customers [Ahrefs’ Blog Case Study]. You’re in good hands, so sit back and enjoy the ride! Guest blogging is a great all‐in‐one method to establish presence within your niche, grow your backlink profile and make some connections in the industry–all of which are instrumental to promote your website in the long run. How it works in a nutshell: you write for other blogs. our CMO Tim Soulo used to employ this strategy a lot. When you write for prominent sites in your niche, you’re putting your content in prime places to reach the right people–namely, those who are interested in your topic and who will enjoy your content enough to look for more of it. Translation: more traffic for your website! Don’t get me wrong; you’re likely to see some form of traffic come your way with this method. It just may not prove to be the most stable or sustainable. Remember: you want to blog in the right places and for the right people. Let’s start with how to find the best blogs to target. You’ll want to do some research and create a list of well‐known blogs relevant to your niche; posting outside of your niche won’t bring you any quality traffic. For this, a tool like Ahrefs’ Content Explorer can be really useful. Just type in a phrase relevant to your industry to pull a list of the most popular websites that are blogging about your topic. Tick “One article per domain”, set your language and adjust the organic traffic filter (we used 1,000+ here) to trim the list. Then you can export it and begin preparing your pitch! Don’t spam your prospects. There are certain techniques to getting a favourable response from strangers on the internet, and mass‐emailing a template you created in three minutes is not one of them. Do your research on the blog and editor you’re reaching out to. Dedicate some time and effort in acquainting yourself with the blog’s content and check out the other guest bloggers already posting there. Always follow the style and formatting of the blog you’re guest posting for. If every existing article uses lots of headers and bolded text, follow suit. If every article consistently hits the 3,000 word mark and includes tons of screenshots, do the same. You get the gist. The review process differs for each blog, so follow the lead of your editor. Be courteous and accommodating! When linking back to your website, remember to also include links to the blog’s existing content. This makes your post a lot less self‐promotional and makes your editor happy–for more tips and tactics, see this article on writing a wildly successful guest post. When writing guest posts for different blogs, you can link to your older posts from your new posts. This way, you avoid excessively linking to your own website, all editors involved are happy and you even get some backlinks to your other guest posts out of the deal. Thanks to Nick Churick for this tip! Search Engine Optimisation, or SEO for short, is the process of getting your website ranked highly on search engines like Google. Think: if you were selling flowers, and your website is the number one Google result for “flower delivery”, just how much traffic would your website get? our blog’s organic traffic growth in isolation for the past ~3 years. And this is what it looks like using other methods. traffic generation after publishing a guest post. In the land of SEO, this is commonly known as a “spike of hope”–which rapidly degenerates into a “flatline of nope”. The breakdown: you see a nice boost in traffic when the post is first published and promoted, but this referral traffic soon fades… leaving you scrambling for the time and resources needed to maintain this strategy. Yes, SEO can be complex beast. But here’s just how to do it. The work begins even before you produce your content. Keyword research is essential to your SEO success: you do this to make sure that there’s a market for the content you’re about to produce. When your content ranks for tons of popular search terms, that’s when your traffic begins to soar. Since there are too many variables involved in performing keyword research (everybody’s goals, resources, timeframes, competitive landscapes, etc differ), there’s no one‐size‐fits‐all method to this. Instead, here’s a reliable keyword research framework that you can adjust to your needs. You might also be interested in learning how to find the easiest keywords to rank for. Whether you’re creating brand new content or working with existing posts, you’ll need to optimise them to rank in Google. This involves lots of research, copywriting work and multiple other factors. Believe me when I say that there’s tons to go into which we don’t have space to explore here. Interested in learning more? Head on over to this post on actionable steps you can take to attract more organic search traffic. A backlink is simply a link back (hence the name!) to your website from another page. It’s seen as an indicator of how important, or useful, your content is by search engines. In other words, having a high number of quality backlinks is a big influential factor in ranking highly on search engines. 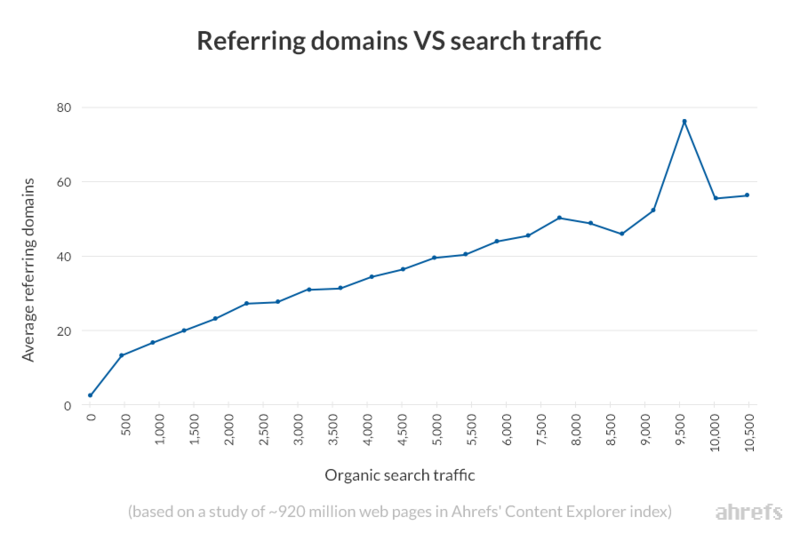 a study we did shows the high correlation between referring domains and organic search traffic. Once you have great content, it’s time to begin building backlinks to it. There are plenty of ways to get going–for starters, take your pick from newbie‐friendly skills and tactics or learn some methods to loot your competitors’ backlinks. The “front page of the internet” has huge potential only if you know how to tap it. For the uninitiated, Reddit is a place where you can share and discuss just about any topic that doesn’t go against the rules with it’s millions of users. What makes Reddit stand out in particular to marketers is that blatant advertising will not work here. Redditors are an incredibly smart and equally skeptical bunch; they will smell your ad from three blocks away and drop a ban on you. Think marathon, not sprint, when you’re trying to promote on Reddit. Prove that you have something worth saying before you actually say it. Where Reddit is concerned, this is most likely a subreddit–a niche forum with its own set of rules and moderators. 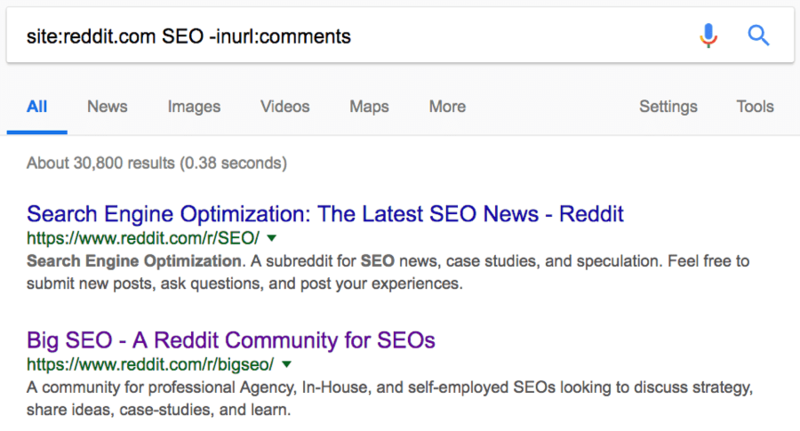 A simple google search for site:reddit.com <your niche> -inurl:”comments” should reveal a bunch of options: this is where your target audience hangs out, and the place you’ll need to acquaint yourself with. we tend to lurk at subreddits like r/seo/ and r/bigseo/. It’s time to integrate yourself! 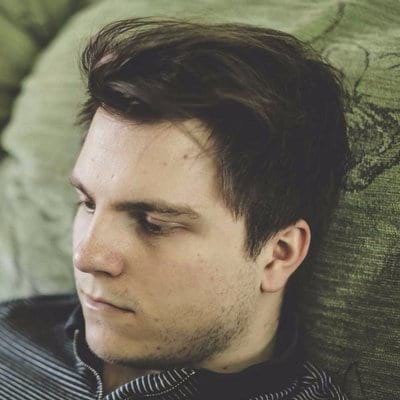 Focus on following the relevant communities; on building reputation, relationships and reddit karma. 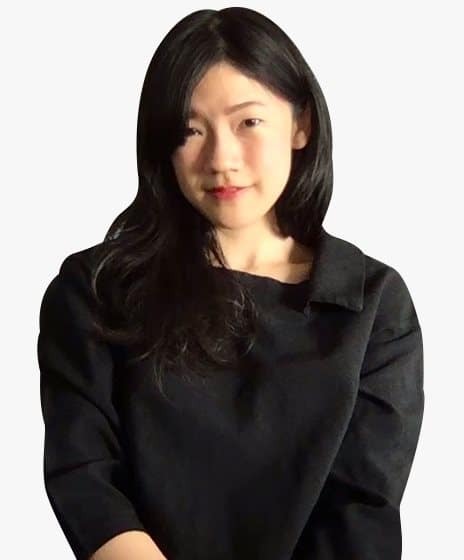 Each subreddit is different, so pay attention to what works for each audience (Do they have a fun‐loving culture and love gifs and memes? Are they fond of lengthy, wordy discourse? Act accordingly.) Your approach matters a lot and determines whether you quickly become a regular in the community. Post thoughtful, insightful comments, and others will begin to return the favour. Of course, make sure to read the rules of each subreddit and follow them religiously. Once you’ve spent a good amount of time giving back to the community and making some friends, you may start referencing your own website. Even then, try to go about it in a way that doesn’t scream “blatant advertisement”. Asking for opinions or positioning your website as something that might help out or interest the community are some ways to go about it. this is how Ahrefs crowd‐sources feedback and insights from Reddit. Despite also being classified as an online forum, Quora is a very different animal from Reddit. In a nutshell, it’s a question‐and‐answer site that’s entirely user‐generated. As a Quora user, you can choose to either ask questions or to answer them. 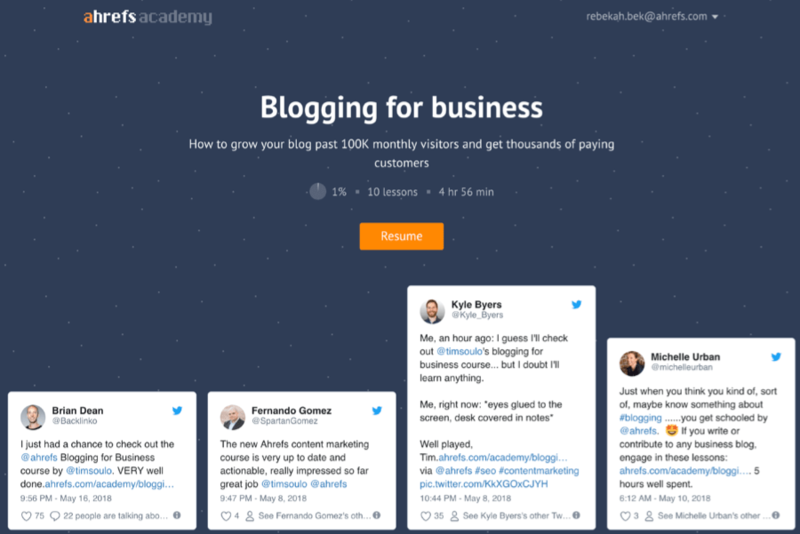 Think of Quora as a knowledge market: it’s a great place to respond to questions within your niche, establish authority and generate some traffic for your website along the way. This strategy can take up a lot of your time and requires dedication and some smarts, but can really pay off. Marketing on Quora can be a little confusing at first – here’s some guidance on just how to do it. It helps to think of this tactic as similar to guest posting. It’s all about strategic placement of your content: right channel, right people. The simplest way to start is by using the search bar in Quora itself. Quora allows you to do both generic searches, as well as searches within a specific topic. After which, it’s a matter of sifting out the questions you’re able to confidently position yourself as an authority on. The next step? Figure out which are the more popular questions to go after. To do this, look at the right sidebar when logged into Quora. At first glance, the above screenshot shows that a question has 129,000 views. Good potential! The last step is to look at recent answers posted to each question. If they’ve managed to chalk up lots of views as well, you’re on to a good thing. On the flip side, if an answer from 2014 has 8k views but one from three months ago has 40 views, it’s probably a dead topic. Move on in this case. Post a good answer to each question while linking to your website where possible. Relevancy is key here; write to provide the best answer you can and don’t shoehorn your link in. Be succinct and focus on providing value. Of course, it’s best if the link is to content on your website that discusses the topic in further depth. Keep in mind that if your answer isn’t great to begin with, nobody is going to click the link you offered to “learn more”. Want an easy way to find low competition keywords/topics? 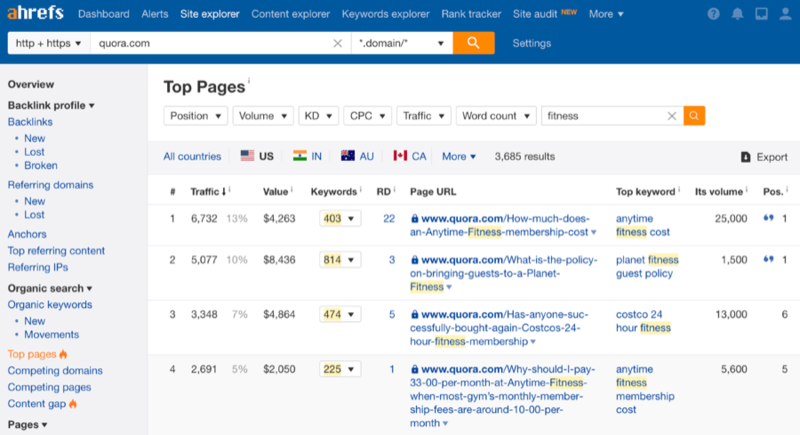 Go to Ahrefs’ Site Explorer > Input quora.com > Hit “Top Pages” > Search for your topic. Look for a low number of referring domains and scan the Traffic + Top Keyword columns. If anything stands out, look at the URL and find out what the question is about. Then find your keyword from there. Thanks to Sam Oh for this tip! We’re all familiar with social media to a certain degree. But as you can guess, being a casual user of a social network and actually attempting to market on the same channel are two very different things. Generally speaking, there are two ways to go about social media marketing: the “organic” way through community building/marketing, and through paid ads (relatively quick to set up and guaranteed to deliver on goals.) Since we’re focusing exclusively on the former, let’s get into it! Facebook needs no introduction. It’s huge; there are billions of people using it; most of the people you know are on it. It’s just a matter of how you target and engage your ideal audience. Creating a page is absolutely free. By doing this, you’re establishing your brand’s presence on the network—instantly allowing you to connect and engage with its millions of users. Fill up your page with details and encourage people to “like” it, then create a consistent content schedule to show that you’re active and there’s work being put into your brand. If the updates you post are relevant to your niche, it shouldn’t be too difficult to include a link back to your website. As more of your ideal audience discovers your content and page, traffic to your website will follow. More tips on creating an engaging Facebook page here. recent post statistics from the Ahrefs Facebook page. Facebook groups are made up of communities of people who share a common interest. The great thing is their diversity: there’s one for every topic you can think of (and tons more you’d never imagine existed!) Of course, finding and joining groups that revolve around your niche allows you prime access to your ideal audience. The strategy for promoting in Facebook groups is very similar to that of promoting in forums: after joining, read the rules and dedicate some time to researching the group. Look at how the existing members interact; comment on others’ posts while adding value and being helpful. When you’ve been around for a bit and built some reputation within the community, you can start checking in with group admins to see if it’s appropriate to begin referencing your own website. Twitter is known to be an all‐in‐one approach to hitting your business objectives. You can use it generate leads, promote your website and increase brand awareness, do customer support, and so on and so forth. It’s especially great for reaching new audiences and keeping track of what people are saying about you. As for using it to promote your website? There are a few tips and tricks you can use. The best thing about Twitter is how accessible it is, and how quickly things spread there–there’s a reason why hashtags became a trend. Speaking of which, always remember to use relevant hashtags so other users are able find your tweet when searching for your topic. In general, you want to publish content on Twitter with a link back to your page. Make sure your tweets are as entertaining, informative or (situationally) as provocative as possible to garner shares and retweets. Another tip: Look into Open Graph tags or Twitter Cards to make sure your shares look their best on social media. Used in tandem with good featured images, this can really help to boost your click‐throughs. our own tweets trend towards being informative and educational. Are you a WordPress user? Use a plugin like Yoast SEO to add optimized Open Graph tags to posts quickly and easily. Asking for retweets ensures that your tweet receives exponential exposure the more people share it. Naturally, the more people see the tweet, the more they check out your profile and website. Just make sure that what you’re offering is something worth the number of retweets you’re asking for, and that you follow through in the end! You may also choose to have an industry or topic‐relevant hashtag to both give some context to the giveaway and aggregate entries for ease of review. a simple flash giveaway we held to test the reach of our Twitter banner. Learn more about our Twitter banner experiment in my guest post for Buffer. Outreach is, essentially, a strategy where you get your content in front of bloggers and influencers in your industry, with the aim of getting them to talk about you and link to you. In its simplest form, it’s the act of reaching out and asking for a link back to your website. And yet, great outreach is about a lot more than just asking for a backlink. Still with me? Let’s walk through it. The decision to give you a backlink is made by a real person, not a machine. So: outreach is about communication. Effective communication, at that. You’ll need patience, research skills, and to a certain extent, social savviness and salesmanship. You want to close the deal, and the deal is a link back to your website. Do your research. By now, you know that you’ll need to target websites relevant to your content. So: build a list of prospects and hunt down the person you’ll need to contact. Learn as much as you can about them–their position at the company, if they’ve recently produced a piece of work you can reference and, of course, don’t forget to find out their email address. We’ve collected our best tips on doing outreach here, which range from the types of people to target and when to get in touch, to how to craft an outreach template that’s easy to personalise. This strategy is all about creating valuable, unique content–ideally centered around your brand or product–then offering free access to it. Whether it’s a printable PDF guide or a tutorial series on YouTube, focus on adding value for your audience and you’ll start seeing the magic of word‐of‐mouth advertising at work. actual user feedback for “Blogging for business”, our video tutorial course on how to grow your blog past 100K monthly visitors. this course was free for 30 days upon launch and costs $799 now. As always, note that quality is key! Unoriginal, low‐quality content does not gain traction, no matter how free it is. Your content needs to be relevant to your niche, or it’s unlikely that you’ll see much quality traffic from it. One interesting method of sourcing for ideas is by spying on your competitors. 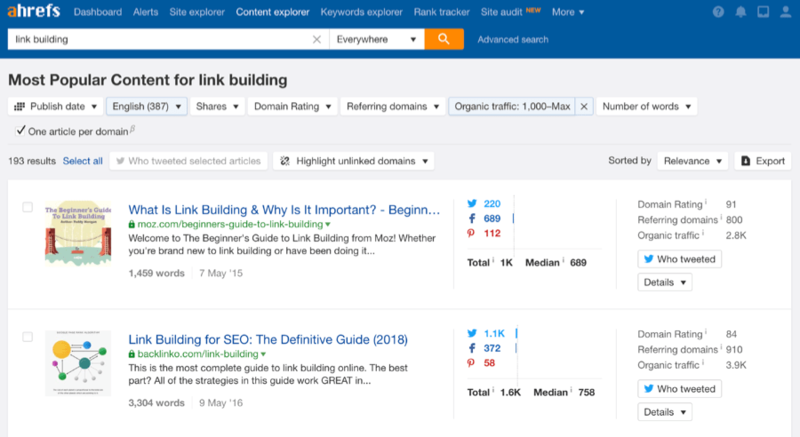 Use Ahrefs’ “Best by links’ growth” report to track which, and what type of, content has been garnering attention and backlinks. Cutting out the extra steps required to send your content across to a friend can make all the difference. So: do yourself a favour and make your resource as shareable as possible. One way to do this is by repurposing your content into bite‐sized chunks–for example, producing a simple infographic that sums up key information and creates talking points for your audience. 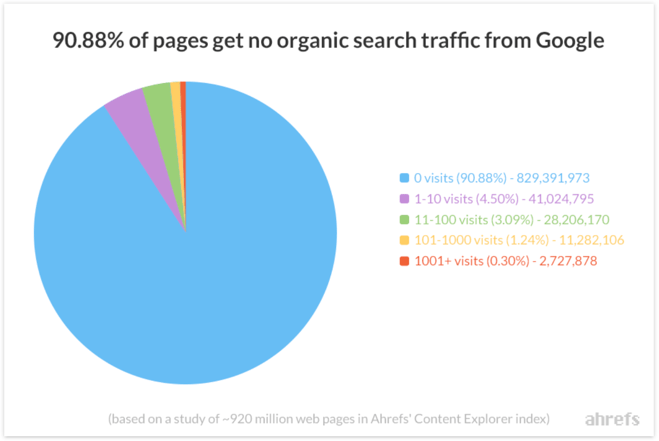 an infographic we created from the data used in a search traffic study. Another traffic tip: use Click‐To‐Tweet links to increase shareability and get more eyeballs on your content. This allows you to customize the exact message your audience will be tweeting out, all while making the actual process of sharing next to effortless. A win‐win situation! This tactic is all about going back to the basics. Sometimes, the best way to build a relationship with people and interest them in your website is the simplest: strike up a conversation. Stay on top of what’s being said in your niche and about your brand, then strategically slide yourself into the discussion where possible. a comment breadcrumb that links to a screenshot of statistics from Ahrefs’ Site Explorer. It’s difficult to join a conversation you don’t know is happening. Thankfully, the solution to this has been packaged nicely in the form of tools like Google Alerts, Talkwalker and our very own Ahrefs Alerts. In a nutshell, these tools send you alerts when your keywords are mentioned online, making it easy to track down what’s being said about your niche anywhere on the web. Mentions Alerts works for any phrase–you can even input your own name or brand name do reputation management. 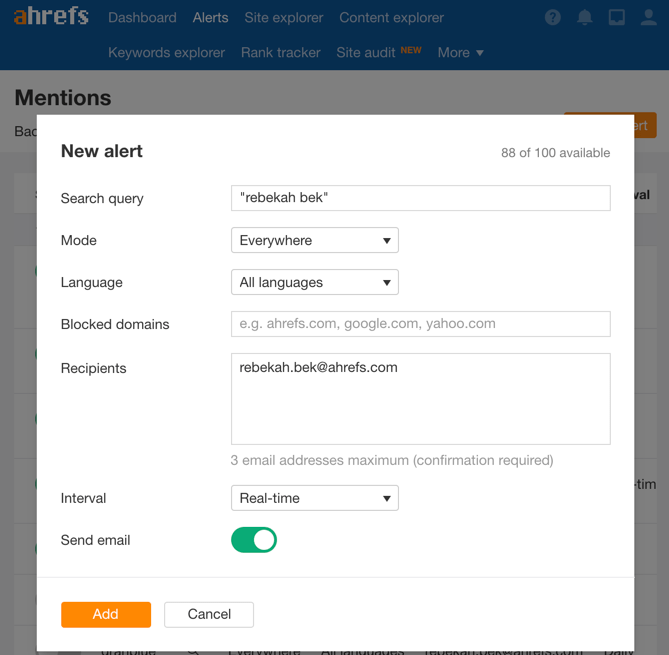 You’ll start receiving email notifications whenever your keywords are mentioned on the web. From there, it’s a simple matter of following the links to the articles and scrolling to the comments section. At the risk of sounding like a broken record, don’t be a spammer. Only speak up when you have something valuable to contribute to the conversation; whether it’s knowledge and advice, or at the very least a link to another source that will be of help. Try to leave your website link sparingly when commenting–only at times where your content is highly relevant. The focus here is on relationship building and knowledge sharing, not leaving your backlink in every comment section you can find. Naturally, there are tons of ways to promote your website besides the tactics listed above. Which strategy ultimately proves the most effective for you depends largely on your unique competitive landscape and the resources at your disposal: timeframe, skill sets, team size etc. We’ll stand by our stance that SEO is the best long‐term method of traffic generation, though. It can be done on a low (or no) budget and brings passive, scalable results, whereas most other methods are one‐off and require consistent effort. What are your thoughts? Have you found huge success with any of these strategies, or has a method not mentioned here worked wonders for you?